Silver Past Master's Jewel suspended from a sky blue ribbon by two silver and blue enamel bars. The top bar has the name of the town where the Lodge meets "Banbridge". The bottom bar, its number, "No. 336". History of Union Band Lodge No. 336. Warrant No. 336 issued to ‘Union Band Lodge’ in BANBRIDGE, County Down on the 4th October, 1759. "Warrant No. 336 to Banbridge 4 October, 1759 - Alex. Fullerton; John O’Caene and Jas. Crawford being the first three of twenty-two brethren shown as registered 4 October, 1759." Lodge No. 336 on the 4th July, 1782 petitioned Grand Lodge to have arrears forgiven on payment of £4. 11s. 0d. [£4.55] - "Granted." "7 March, 1793 - Read again the Petition of No. 521, 706, 715 & 737, relative to the forming a Committee in the Co. of Down, read also a 2nd Petition from the said Lodges No. 269, 624, 659 & sundry Letters from No. 314, 336, 367, 446, 477, 606, 609, 659. Ordered that the Secy. 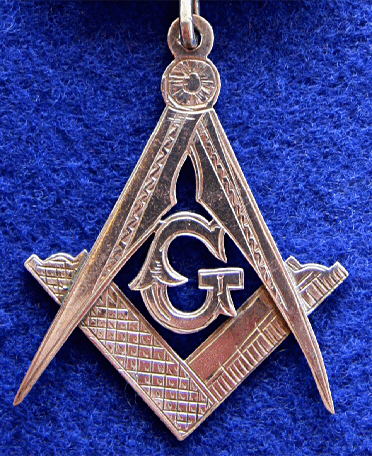 do inform these Lodges - That the Grand Lodge of Ireland at the solicitation of a number of Lodges in the Co. of Down did transmit certain Regulations for their Consideration, such as have been adopted by the Cos. of Armagh, Monaghan & Tyrone and have in these Cos. proved greatly beneficial to the Craft. It is for the respective Lodges in the Co. of Down to determine whether they wish to submit thereto & the G.L. therefore recommend that the same may be taken into consideration at a general meeting of all the Lodges in the County of Down." Belfast News Letter ~ 4th January 1805. The Master, Wardens & Brethren of the following Lodges viz. Nos. 126, 336, 477, 526, 715, 737, 764, 941, and 954, return their sincere thanks to their worthy Brother the Rev. Charles Hamilton, Vicar of Tullylish, for the excellent Sermon preached to them, in the Parish Church of Seapatrick on St. John's Day last. Newry Telegraph ~ 26 June, 1835.
particularly he warned them, on such an occasion as the present, not to "use their liberty as a cloak" for intemperance or excess.He then pointed out the near connection which exists between Freemasonry and Christianity; and, leading their minds to the consideration of the "Masonic Ladder", enlarged upon the subjects of Faith, Hope and Charity - urging upon them, strongly, an adherence to the dictates of the last Virtue, by treating, with the utmost forbearance, those who conscientiously differed from them in religious or political opinions, and to show acts of Kindness and benevolence to the distressed. He enforced all these points by a reference to their duty, not only as Freemasons, but as Christians. After Church the Brethren walked again in most quiet and orderly manner to Trevor Hill, where they formed themselves into a hollow square; and, having greeted each other with a public Masonic Salute, returned to their respective Lodge Rooms. "Our Brethren all over the Globe". The Brethren return their grateful thanks to the Rev. Dr. Campbell, for the kind manner in which he granted to them the accommodation of St. Mary's Church." Newry Telegraph ~ 6th July, 1844. On Monday, the 24th ult., being the Anniversary of St. John the Baptist, on the invitation of St. John's Lodge, No. 134, a large and respectable body of the Brotherhood, accompanied by several bands of music, assembled in Waringstown, and thence proceeded to Lurgan Church, where a most excellent and highly appropriate Sermon was preached by the Rev. W.P. Oulton, from 1 Peter 11, 17. There were sixteen flags in the procession, and the appearance of the Brethren, decorated in regular Masonic costume, and carrying the various symbols and badges of the Order, was truly beautiful. The Waringstown band headed the procession into Lurgan, playing various Masonic airs, in a creditable and masterly manner. After partaking of refreshments in Lurgan, the various Lodges, were accompanied part of the way to their respective places of meeting by Lodge 134, who then returned to town, and sat down to an excellent and substantial dinner, in the house of Mr. John Douglas, and broke up at an early hour, highly gratified with the harmony, peace, and brotherly love, which characterised the proceedings of the day. Although there were not fewer than 5,000 strangers in the town, not a single riot or breach of the peace occurred during the entire day, which was characterised by the entire absence of intoxication. There never was so large or so respectable a Masonic Procession seen in Lurgan. Banbridge Lodge No. 336, was particularly admired; and Lurgan Lodge, No. 134 came in for their share of public approbation." A total of 330 brethren either transcribed from the previous volume or registered up to the 13th October, 1859. Series three Vol. 8 of the extant Grand Lodge Register commence with four brethren shown as registered prior to the 1st November 1860 then a line across the page. Registrations then continue with Thomas Gordon registered on the 6th November, 1860. On the 6th December 1878 a total of ten brethren are shown as affiliating to this lodge from Lodge No. 124. From time to time there are other blocks of registrations of brethren affiliating. Newry Telegraph ~ 29 May, 1863. On Monday evening, the 25th inst. the Brethren of Union Band Masonic Lodge No. 336, Banbridge, met in their Lodge-room, for the purpose of presenting Br. Peter Shade with an Address and Presentation, previous to his departure for Spain. The Lodge having been opened in due form, by request of the W.M. Br. Noble read the Address and made the Presentation, which consisted of some beautiful emblems. Br. Shade replied in very feeling terms, expressing his regret at leaving - not only the Lodge of his adoption, but also the Brethren and friends, from whom he had experienced so much brotherly love and courtesy during his residence in Banbridge. The Lodge was then closed; and the Brethren adjourned to the Downshire Arms Hotel, where a scrumptious supper was provided by the proprietor, Br. Young. After the cloth was removed Br. Ferguson was called to the Chair, Br. Young occupying the Vice-Chair. The usual loyal and Masonic toasts were then given, and drunk with great enthusiasm; after which the health of "Our Guest, Br. Shade," was proposed by the Chairman, who expressed his regret at the cause of our assembling on the occasion, bearing testimony to the very deserved popularity of Br. Shade, not only as a Mason and fellow-townsman, but also as a zealous and efficient manager for Messrs Green and King, who have so successfully completed the railway between Banbridge and Lisburn; and who has been characterised in all his business transactions by that urbanity and gentlemanly bearing, which render our regret twofold at his departure from among us. The pleasures of the evening were greatly enhanced by several Masonic and other songs being sung by several of the Brethren present: and, after the thanks of the meeting had been conveyed to Br. Young, for the very creditable manner in which he had got up the entertainment, the Brethren returned to their respective homes". Lodge No. 336 recorded as working in Banbridge as seen in a letter from the P.G. Sec of the P.G.L. of South Down to D.G. Sec, G.L. of I. dated the 2nd September, 1863. 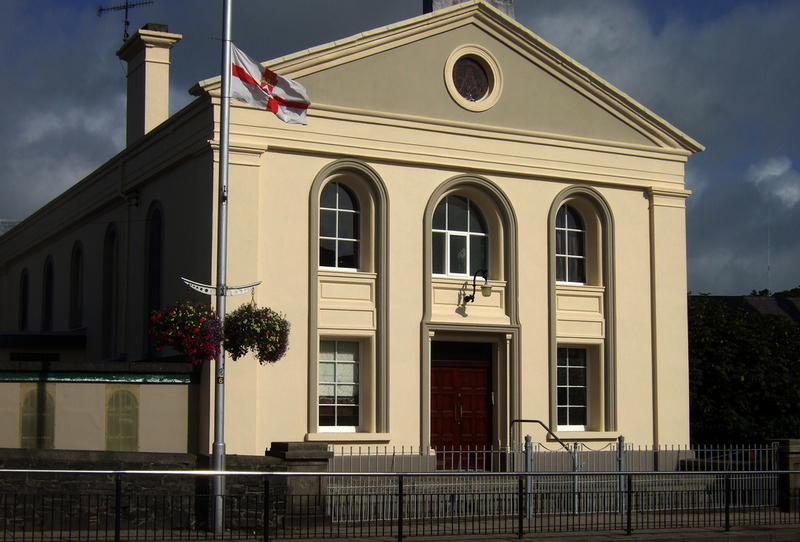 "29 November, 1875 – Read a Memorial from Lodges 119, 124 and 336 Banbridge for permission to change their place of meeting to a private House, which they have had fitted up for Masonic purposes, recommended by the Provincial Grand Master - Permission granted." In November 1878, members of Lodge No. 124 joined Lodge No. 336. A total of 169 brethren registered up to the 1st January, 1901. In most cases the dates when the degrees were conferred and the issue of certificates is shown. Belfast News Letter ~ 1st July, 1907. On Sunday an interesting Masonic service under the auspices of the Banbridge Masonic Lodges Nos. 119, 296, and 336, was held in Scarva Street, Presbyterian Church, kindly granted for the occasion by the Rev. Thomas Boyd. There was an exceedingly large attendance of the members, including visitors from Belfast, Lisburn, Rathfriland, Hillsborough and other centres. The brethren assembled in the schoolroom, and marched in processional order to the church, the body of which was reserved for their accommodation. The special preacher on the occasion was Br. the Rev. John Logan, MA., LL.D., Dromara. The introductory service having been gone through, a special anthem, "In the beginning God created the heaven and the earth," and "O rest in the Lord," with chorus, was rendered by a specially trained choir, with much expression and merit, under the able leadership of Br. Edward S. Mills, L. Mus., P.P.G. organist. The Rev. gentleman, from the concluding words of the 27th verse of the 17th Acts, "Though He be not far from every one of us," delivered an instructive address. At the conclusion of his remarks he made a strong appeal on behalf of the Masonic Orphan Schools, which was liberally responded to. The visiting brethren were afterwards hospitably entertained by the Banbridge brethren in the Masonic Institute. Twenty members served of UNION LODGE NO. 336 in the 1914 -18 War and Bros. Surg. J.S.D. MacCormac, RN., Lieut. Wm. F. Power, Canadians, Lt. Cdr T. Steele, R.N.R. and Capt. R. Ussher-Greer, C.F. made the supreme sacrifice. A total of 193 brethren registered up to the 2nd October, 1923. In most cases the dates when the issue of certificates is shown, together with the occupation of the brother. Series five Vol. 19 shown as Vol. 3 of the extant Grand Lodge Register commences with the registration of John J. Thompson, H.S. Teacher, registered on the 3rd February, 1925. A total of 95 brethren registered up to the 14th July, 1954. In most cases the dates when the issue of certificates is shown, together with the occupation of the brother. Series six Vol. 22 of the extant Grand Lodge Register commences with the registration of James C. Grant, School Teacher, registered on the 1st December, 1953. A total of 104 brethren registered up to the 14th December, 1983. In most cases the dates when the issue of certificates is shown, together with the occupation of the brother. From 1984 the registration of members of UNION LODGE NO. 336 is held, in alphabetical order, in a computerised register by Grand Lodge, Freemasons’ Hall, 17 Molesworth Street, Dublin 2. The Registration of the Worshipful Master, Wardens and Secretary of Lodges are held in separate Registers, the first Volume covering the period 1983 to 1994 inclusive and the second Volume covering from 1995 to date. A History of Union Band Lodge No.336 ~ by W.Bro. F.P. Beckett. A History of Union Band Lodge No.336 by W.Bro. F.P. Beckett can be accessed through the following Link - A History of Union Band Lodge No.336. An Extract from a Newspaper Article concerning the Dedication of the Masonic Hall, Banbridge and Union Band Lodge No. 366. An Extract from a Newspaper Article concerning Union Band Lodge No. 336 can be accessed through the following Link - Masonic Hall and Union Band Lodge No. 336. Details of when Union Band Lodge no. 336 meets. Union Band Lodge No. 336 meets on the 1st Tues. at 8.00p.m. (Except 6,7 & 8) at The Masonic Hall, 6 Church Square, Banbridge BT32 4AT, County Down.